Catfish are among the most incredible creatures on the planet. They smell, taste, and even “hear” through sensory reception pores on their skin, which makes hunting them a unique challenge. On one hand, they are very easy to lure to where you want them to be, but on the other, they can sense predators like yourself very easily, and will behave cautiously to avoid getting caught. You need to learn about the catfish’s unique senses in order to be able to exploit and capture them on your fishing line. In order to take advantage of catfish’s incredible sense of smell, you need to bait the area you’re fishing prior to the catfish’s arrival. However, catfish aren’t attracted to the same sorts of smells that you and I are attracted to, simply because their noses work differently. Not to mention, smells get transmitted through the water much differently than they get transmitted through the air. 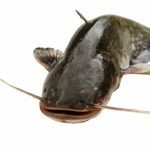 One old-time catfishing trick is to soak grains (horse feed, mule feed, oats) in water for several days, then grab a couple coffee cans’ worth and dump the sour mush in the water where you want to catch catfish. Within an hour, the catfish should be swarming the area. Catfish’s extraordinary sense of smell also helps you figure out what type of bait to use. However, in this case it’s not so much “the smellier the better” as it is “the more chemically-interesting, the better.” Amino acids get catfish’s attention more quickly than anything else, so make sure you use cut bait. The bloodier the better! The more saturated with food-smell the area is, the more likely the fish won’t pay attention to you in the boat and will focus entirely on the bleeding cut bait. Catfish love the taste of blood, as mentioned before. When you’re fishing for catfish, you’re essentially hunting one of the best hunters there is. Therefore, it is imperative that you simulate his prey with your bait. The best types of prey for hunting catfish are meaty, fishy chunks like crawfish, shad, and chicken livers, as well as thick juicy night crawlers. As you drift up the river that your catfish prey call home, you need to be completely silent. Catfish “hear” through their bodies, by detecting sound waves as they travel through the water. You know how it is when you’re at a concert and the amps are cranked as high as they go, and you can feel the bass beat jiggling your gut? Every rocking or bumping you make in the boat feels like that to the catfish. This will alert the catfish to the presence of a dangerous intruder, and you won’t have much luck in the hunt. You can use this hearing to your advantage though, and use a light enough ball sinker to make sure that your hook trails above the ocean floor. The catfish will “hear” the currents caused by the boat and by the bait, and will be attracted to it. While catfish can see just fine, they don’t rely on their eyesight for hunting. Therefore, they tend to roam the waterways at night, preying on unsuspecting fish and insects whose senses aren’t quite as acute. Therefore, if you’re looking for a catfish dinner, don’t go out during the day time; wait till moonrise to take to the river. Catfish are sensitive to the slightest variations in electrical fields surrounding them. This makes them very good at sensing and catching live prey. However, you can use this to your advantage when a catfish bites your hook and begins to put up a fight. What you have to do is use its hypersensitivity against it. The best fishermen keep catfish off balance by applying pressure then suddenly releasing it, or jerking the rod horizontally left and right, forcing catfish to adapt quickly to changing situations. Hypersensitivity isn’t well-suited for these chaotic situations, and using this technique you can land any catfish in five minutes or less.